Let's be absolutely honest and not pretend to be lofty about it - when we cook, we cook to please others... We revel in the sense of pride and achievement when the ones we feed manifest delight over what we serve them. Well, luckily for most of us (food bloggers like us, anyway...) we actually find delight in cooking and pleasing our audience. So in the end, the endeavour is quite a win-win for both parties actually... wait a minute, I need to tag a little asterisk to that... provided the audience is appreciative. I picked up this recipe almost 10 years ago at a company team building cooking event. I was given the task of creating this dessert dish which eventually went on to become the unofficial winner of the meal. It was the first time I marinated strawberries with balsamic vinegar and I recall creasing my brows in sceptism as I read through the recipe then. It was also the first time I infused cream with a herb like thyme and I believe it was possibly also my first time having a working experience with those flimsy phyllo sheets. Yes, I was a late bloomer when it comes to pastry... 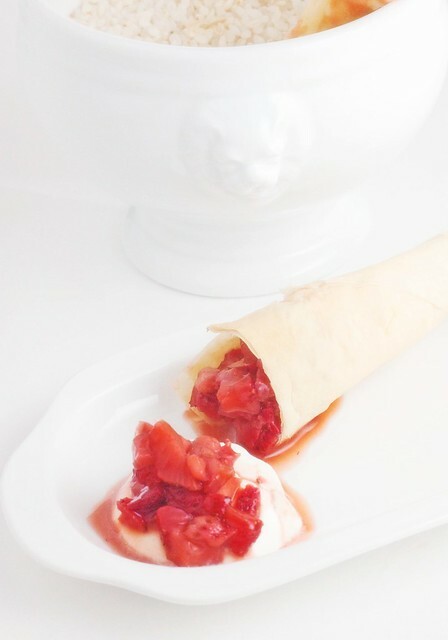 The flavours, I recall, were so subtly elegant and the presentation with the phyllo nests ( I modify it to a cone here), so gourmet that I almost believed that I have some innate talent for baking. And...wait for it.... the recipe is really easy to follow. Utterly accessible and feasible for home cooks of all abilities! Doubt not and hesitate not - get into the kitchen and start cooking! 2. Remove thyme. Return to heat ad bring back to boil. Add sugar and let simmer for 3-4 mins. 3. Take off heat and stir in lime juice. Chill in fridge for 2 hours. 4. Dice strawberries and sprinkle sugar and balsamic vinegar tover it. 5. Allow to marinate for minimum 30mins. 6. Butter 3 sheets of phyllo, layer on top of each other, then cut to rectangles. Wrap them around butter cone molds and bake in over at 180C for about 10mins or until brown. (Alternatively, cut sheets into 4 inch squares and press these squares into lightly greased small muffin tins. 1. Pipe or spoon Lime thyme cream into phyllo cases. 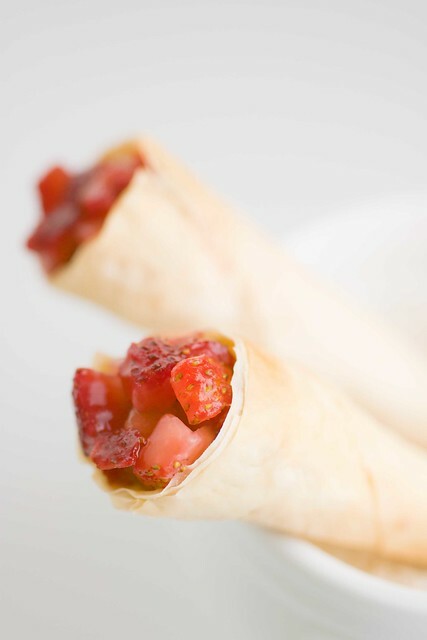 Top with marinated strawberries and serve immediately. Looking at the photograph, biting the strawberries part with the pastry seems delish! that's so true- i do like seeing other ppl enjoying my food. While I love the texture of phyllo, I am often frustrated as I am removing its sheets! You make it look so pretty! If my hubby is unappreciative of my food, I won't cook him another meal. It is so true- that we cook not only to please ourselves but also to please others. 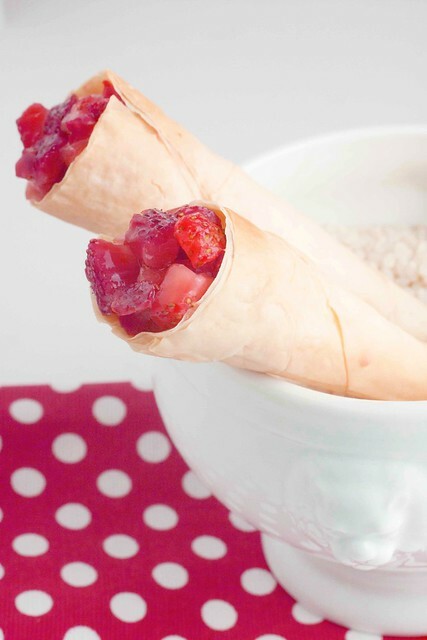 These filo cones look impossibly sophisticated I'm surprised the recipe's so short! I like the sound of the lime cream. Sounds really refreshing and appetizing. :) thanks for another great recipe! Hmm I like the sound of these, the addition of thyme sounds really good! Phyllo is definitely a quick and easy way to make delicious savoury and sweet treats. interesting dessert, never have this before. Looks delicious and elegant too as a dessert! Hmm I have some phyllo in the freezer ... thinking cap on!! First time seeing this dessert! Strawberry and balsamic? Whoa! This looks absolutely stunning .. I have never tried this - so pretty and beautifully done. Nice pictures too. I am loving the flavour combinations. This really looks like an easy crowd pleaser! Those crispy girly rolls look scrumpy!